MyCat Custom patterns let you pay a one time patterning fee to have us make and use a custom pattern each time for your cat or kitten. Items: Full fit, All garments, long sleeve, turtleneck and custom clothing. Includes: By email: A template and instructions to measure your cat. 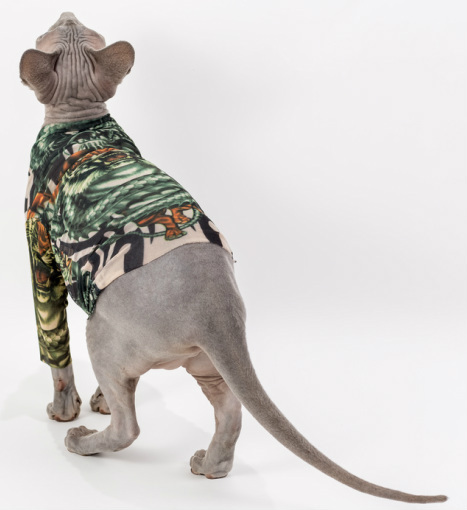 We will generate and ship you a fit garment and instructions on how to make sure your cat is properly fitted. You will recieve return postage to send it back to us. If it has to be done more than once there is an additional $20.00 fee for each time. Once is usually enough. Once we are both content that it is properly fitted, whenever you shop with us, you can select the "MyCat" choice instead of a size, and write in your code. Items: All garments that are sleeveless or short sleeve. Please make sure that you have given us an email that you check at regular intervals. Please click your browsers arrow back button to return to your Etsy Experience.